December 23, 2008 by rwb, under Electronics. Most of microcontrollers work within 5 volt environment and the I/O port can only handle current up to 20mA; therefore if we want to attach the microcontroller’s I/O port to different voltage level circuit or to drive devices with more than 20mA; we need to use the interface circuit. One of the popular method is to use the Bipolar Junction Transistor (BJT) or we just called it transistor in this tutorial. I have to make clear on this BJT type to differentiate among the other types of transistors family such as FET (Field Effect Transistor), MOSFET (Metal Oxide Semiconductor FET), VMOS (Vertical MOSFET) and UJT (Uni-Junction Transistor). The transistor actually works as a current gainer; any current applied to the base terminal will be multiplied by the current gain factor of the transistor which known as hFE. Therefore transistor can be used as amplifier; any small signal (very small current) applied to the base terminal will be amplified by the factor of hFE and reflected as a collector current on the collector terminal side. Off state: in this state there is no base current applied or IB = 0. On active state: in this state any changes in IB will cause changes in IC as well or IC = IB x hFE. This type of state is suitable when we use transistor as a signal amplifier because transistor is said is in the linear state. For example if we have a transistor with gain of 100 and we increase the IB from 10uA to 100uA; this will cause the IC to swing from 1000uA to 10000uA (1 mA to 10 mA). On saturate state: in this state any changes in IB will not cause changes in IC anymore (not linear) or we could say IC is nearly constant. We never use this state to run the transistor as a signal amplifier (class A amplifier) because the output signal will be clamped when the transistor is saturate. This is the type of state that we are looking for on this tutorial. 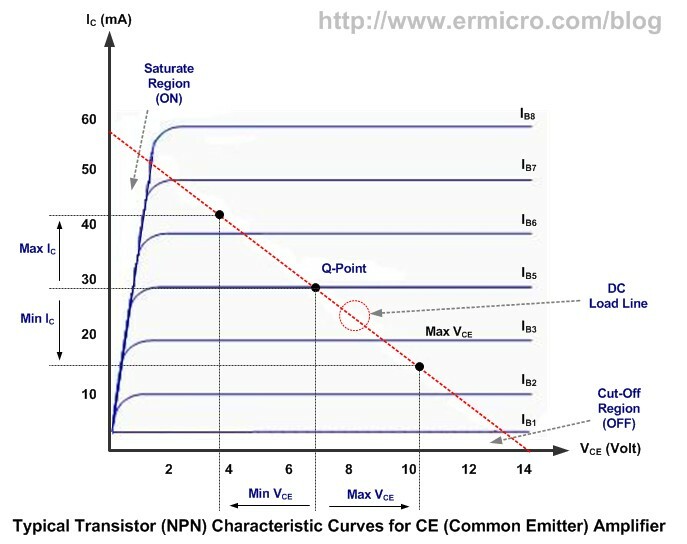 From the picture above we could see the voltage and current condition of transistor on each state; if you notice when transistor is in off state the voltage across collector and emitter terminal is equal to the supplied voltage, this is equivalent to the open circuit and when transistor is in saturate state the collector to emitter voltage is equal or less then 0.2 Volt which is equivalent to the close circuit. Therefore to use transistor as a switch we have to make transistor OFF which equivalent to the logical “0” and SATURATE which is equivalent to the logical “1“. When we operate transistor as the class A common emitter amplifier usually we choose to bias the transistor (apply voltage on VBE and VCE) in such a way (Q-Point) that IC and VCE (output) will swing to its maximum or minimum value without any distortion (swing into the saturation or cut-off region) when the IB (input) swing to its maximum or minimum value; but when we operate the transistor as switch we intentionally push the transistor into its saturation region to get the lowest possible VCE (i.e. near 0.2 volt) when we need to make the transistor ON (switch ON) and into its cut-off region when we need to make the transistor OFF (switch OFF). The above diagram show a typical microcontroller interface circuit using NPN transistor; the RB resistor is used to control the current on base terminal that make transistor OFF and ON (saturate); while the RC resistor is the current limiter for the load. if the load operate with the same voltage as the supplied power (Vcc) you can by pass the RC (not use). Notice the diode (also known as the clamp diode) in the inductive load circuit is needed to protect the transistor again the EMF (Electromotive Force) voltage generated by the inductor component when the transistor is switched on and off rapidly, this voltage is oppose the source voltage. The diode will act as a short circuit to the high voltage generated by the inductor component, you can use any general purpose diode with capable on handling minimum 1 A of current such as 1N4001, 1N4002, etc. 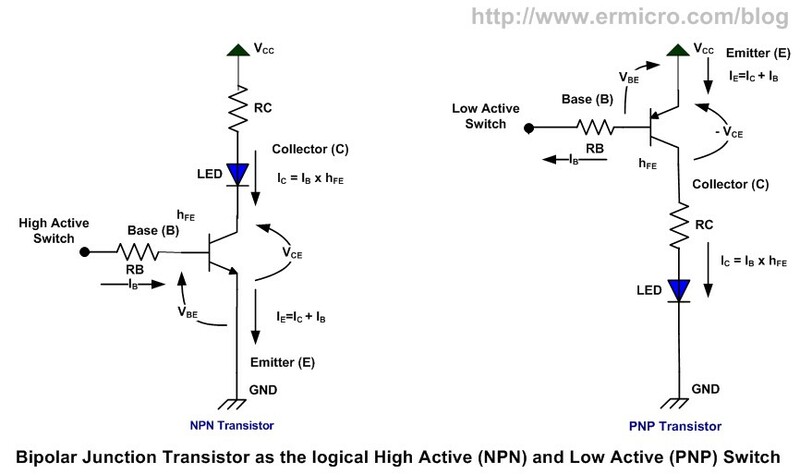 On the picture shown above you could see how we connect the transistor as the high active switch (logical high) also known as low side switch using NPN transistor and the low active switch (logical low) also known as high side switch using PNP transistor. IC = 5 x 15 mA = 75mA (0.075 A), this current is still far bellow the maximum IC allowed by 2N3904 transistor. Base on the above calculation we could use the nearest higher value available on the market; which is 47 Ohm, 0.5 watt resistor (for heat dissipation usually we use twice of the watt value calculated). Base on the result you could use 4K7 Ohm, 0.25 Watt resistor (this is the common resistor which you could easily found on the local market i.e. 0.25 watt and 0.5 watt). Use this RB calculation as your maximum reference value; in the real world most of the transistors hFE is vary and being measured (tested) with different VCE and IC value not to mention different specification even though you use the same transistor type. Therefore the real RB value could be lower than 4K7 if you really want to drive the transistor into its fully saturate mode where the VCE near 0.2 volt. Note: the reason I used RC = 3×150 Ohm because at that time I run out the required 47 Ohm resistor, therefore you could use just single 47 Ohm resistor or if you only have 150 Ohm as I did, you could use them as I did. As you’ve seen from the result there is about 0.4 volt drop on the collector to emitter (VCE) terminal instead of 0 Volt as we assume on the above calculation and the DC current gain is about 58 instead of 100 again as we assume on the above calculation. Now you understand there are tremendous different result between the 2N3904 transistor datasheet and my test circuit, this is because the 2N3904 datasheet is measured using the PWM (Pulse Width Modulation) with period for about 300 us (micro second) and duty cycle for about 2%, the reason to use this very short pulse period method in the measurement is because they don’t want to overheat the transistor junction; where this junction heating will vary the transistor hFE measurement significantly. On my test circuit above; I used 3 second to make the 2N3904 transistor ON (saturate, VBE = 0.81 Volt, VCE = 0.4 Volt) and 1second to make it OFF. The other factor that make the test result differ is the various manufacture specification even though we used the same transistor type. Therefore the answer to the above question is; there is no exact value for RC and RB; is depend on your application but it save to use the above method to calculate the RC and RB and then do the circuit prototyping to test your design, next adjust your RC and RB value accordingly. By using twice the calculated value you will get 933.32 Ohm, or you could use the 1K Ohm standard resistor. In typical rapid switching transistor application actually we don’t drive the transistor into its full saturate state (i.e. VCE = 0.2 Volt), because when the transistor is fully saturate, it tend to have a longer switching time (i.e. from ON to OFF to ON again). The VCE = 0.4 volt as shown on the real test circuit above is already adequate for most switching application, while we could still take advantage of the low transistor base current (i.e. IB = 0.88 mA). 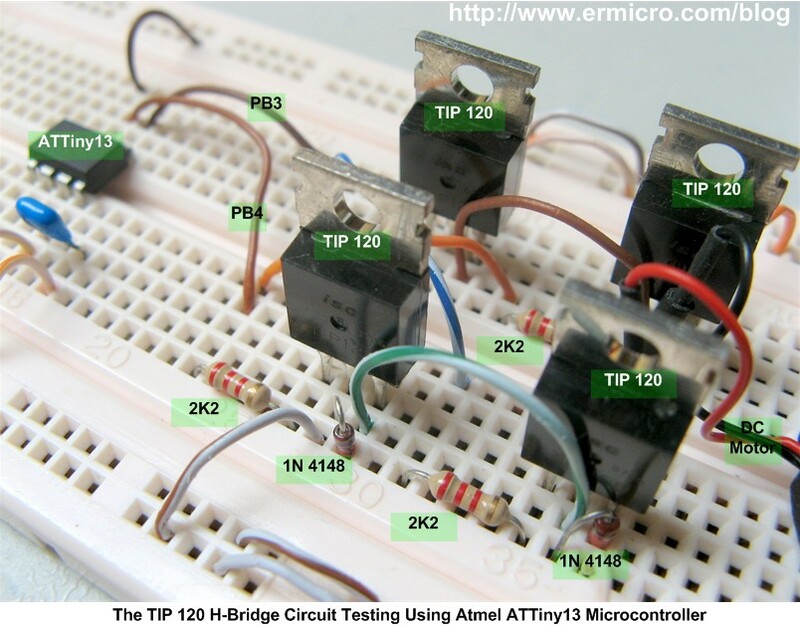 You could see this test circuit on the video at the end of this article. Relay perhaps is one of the oldest electronic components that could be tracked back from the early years when we first use the electricity in our life. 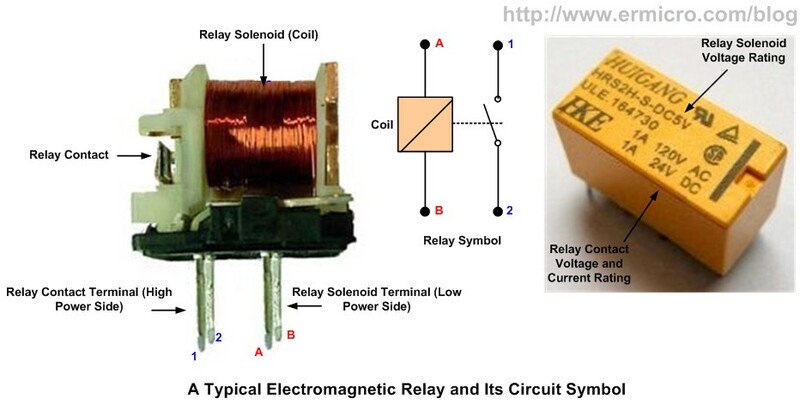 A relay basically is an electrical switch that uses the electromagnetic solenoid to control a switch contact. Because it use the solenoid (inductive load), therefore we need to use a diode to protect the transistor against the EMF. The main advantage of using a relay is that we could “relaying” or pass on the switch effect from a low power side on its solenoid to the high power side on its metal contact by using the electromagnetic effect, where both of the solenoid and contact has its own separate electrical specification. By using the Darlington pair circuit we could combine two transistors; one with high hFE2 factor usually has a low collector current and the one with high collector current usually has a low hFE1factor. This will give you a total hFE of hFE1 x hFE2. In the Darlington pair circuits the VBE will be twice the normal transistor saturated voltage which is about 1.4 Volt. 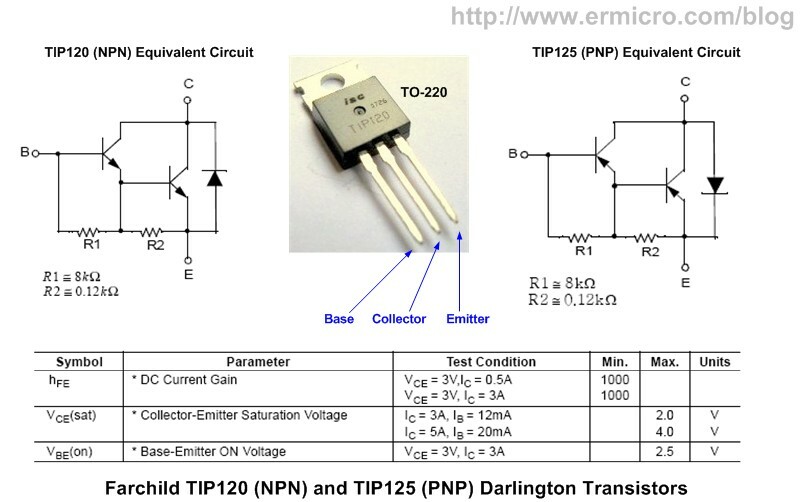 One of the popular ready made Darlington pair transistors on the market are TIP120 (NPN type) and TIP125 (PNP type) which could handle the collector current up to 3 A (max 5 A), and has the hFE minimum of 1000. The TIP120 and TIP125 is called a pair Darlington transistors as they have similar characteristic but have an opposite type (i.e. NPN and PNP), this Darlington transistor pair is popular used in motor controller with the H-Bridge circuit. Remember when you use a power transistor to drive a large collector current, you need to supply the transistor with the adequate heat sink to help cooling the transistor by dissipating heat through the heat sink surface into the surrounding air. 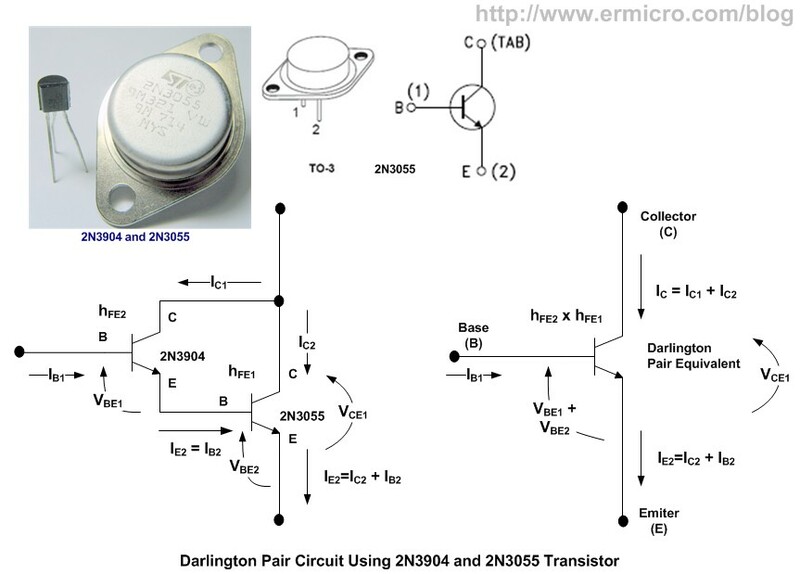 For more compact version of the Darlington pair transistor you could use the Texas Instrument ULN2803A which is contain 8 Darlington pair transistors with has build in 2K7 base resistor and clamp diode for each Darlington pair transistors. This makes this Darlington transistor array suitable for driving the relay or motor up to 500mA (this is a maximum datasheet value) directly from the microcontroller output. Thanks to the build in internal 2K7 base resistor and the two clamp diode, you don’t need any external component when using ULN2803A to drive the DC motor from your microcontroller port. 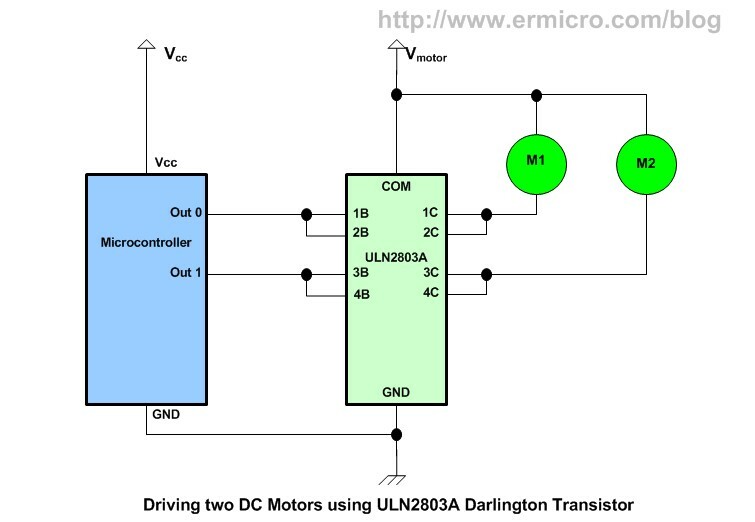 The Darlington transistor array ULN2803A could be used to drive up to 50 volt voltage load. 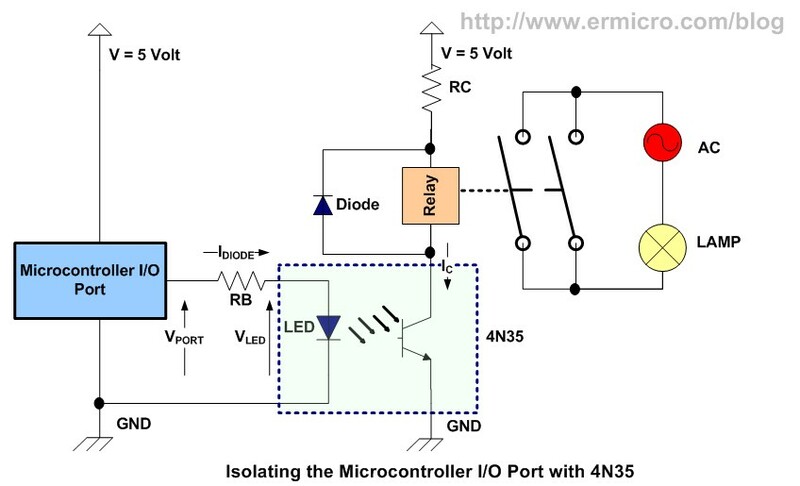 Sometimes we need to isolate our microcontroller circuit from the interface circuit especially in the environment that generating a lot of noise which could disturb our microcontroller operation. 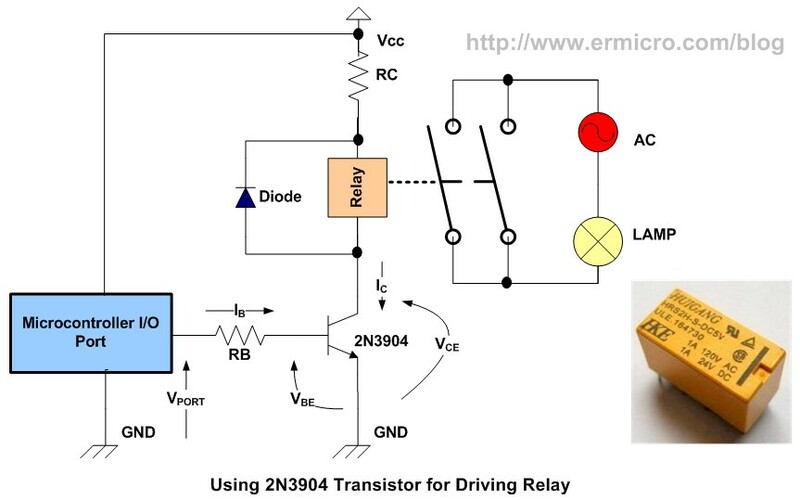 When we use a relay from the above example, the driver ground is still directly connected to the microcontroller circuit, so there is a change the noises will interfere the microcontroller circuit. The popular optocouplers circuit available on the market is 4N35 which has the hFE of 500 (in the optocouplers terminology this is also known as the transistor static forward current transfer ratio, Texas Instrument SOES021C, measured with infrared LED current = 0) and maximum collector current of 100mA. Differ from the ordinary transistor in the optocouplers we don’t use the transistor base terminal for driving the collector current; instead we use the internal infrared LED to transfer the infrared LED light intensity to the phototransitor; based on this infrared LED light intensity the phototransistor will be turned ON or OFF; giving more current to drive this infrared LED will effect more current to flow on the phototransistor collector; This effect is known as the current transfer ratio (CTR). The 100% CTR means that all the current flow on the infrared LED will be transferred 100% to the phototransistor collector. If you need to drive more current you could use the Darlington pair circuit above or you could use the high gain Darlington optocopuler such as 4N45 (CTR minimum about 350 %). Using just one transistor to control the DC motor as the above example; we only can turn the DC motor in one direction if we want to change the direction than we also have to change the DC motor voltage polarity. The other way to work around this condition is to use the relay to switch the DC motor’s voltage polarity, but using this method means the DC motor will always ON and we can not control the DC motor speed using digital signal or known as the PWM (Pulse Width Modulation). When we apply current (IB1) to the TR1 and TR2 transistors, IB2=0 to the TR3 and TR4 transistors, then TR1 and TR4 transistors will be turned ON, TR2 and TR3 will be turned OFF; this will cause the current to start flow through TR1 transistor, passing the DC motor and going into the TR4 transistor (blue color). When we apply current (IB2) to the TR3 and TR4 transistors, IB1=0 to the TR1 and TR2 transistors, then the TR3 and TR2 transistors will be ON while TR1 and TR4 transistors will be turned OFF; this will cause the current to flow through TR3, passing the DC motor in reverse polarity and going into the TR2 transistor (red color). By not applying current to both IB1 and IB2 all the transistors will be turned OFF. One of the advantage using all NPN transistors in the H bridge circuit is the NPN transistor tends to have faster turn on time comparing to the PNP transistor, beside by using the same transistor type we could have similar transistor characteristic in the circuit. 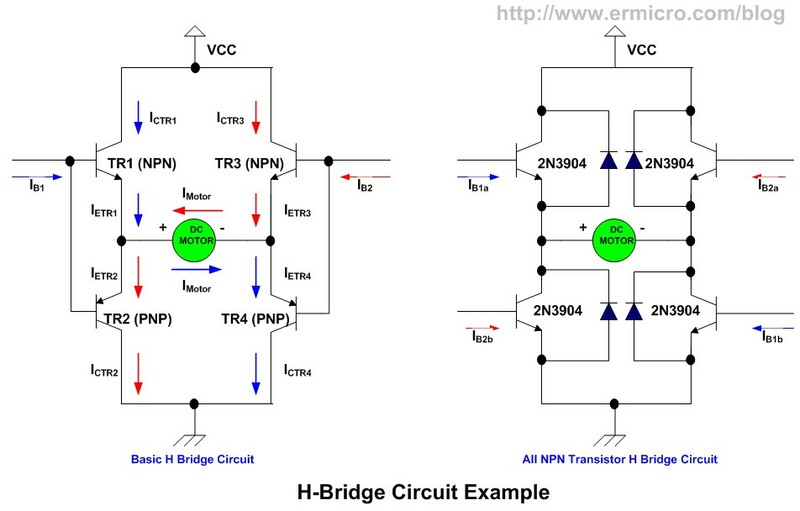 You could read more example of using all NPN transistor H-Bridge in “H-Bridge Microchip PIC Microcontroller PWM Motor Controller” on this blog. The “The Line Follower Robot with Texas Instruments 16-Bit MSP430G2231 Microcontroller” article is a good example of how we use the N-Channel MOSFET to control the DC motor. One type of the brushless electric motor that is designed specifically for digital signal input is called the stepper motor. The stepper motor usually is used when we need to control the precise rotation movement and speed with the open loop control. These advantages make the stepper motor is widely found in many applications such as printers, scanners, disk drives, automotives, CNC machines, toys, and many more. 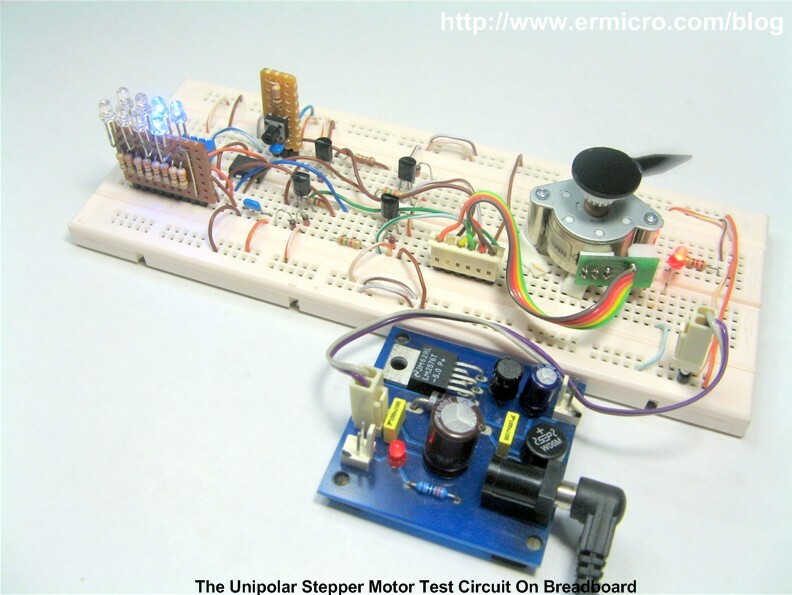 Today the most common used stepper motor types are Unipolar Stepper Motor and Bipolar Stepper Motor. The unipolar stepper motor usually has two windings with a center tap on each of windings, therefore the current could move from the center tap either to the left winding or to the right winding. Usually the unipolar stepper motor comes with 5 or 6 terminal leads. 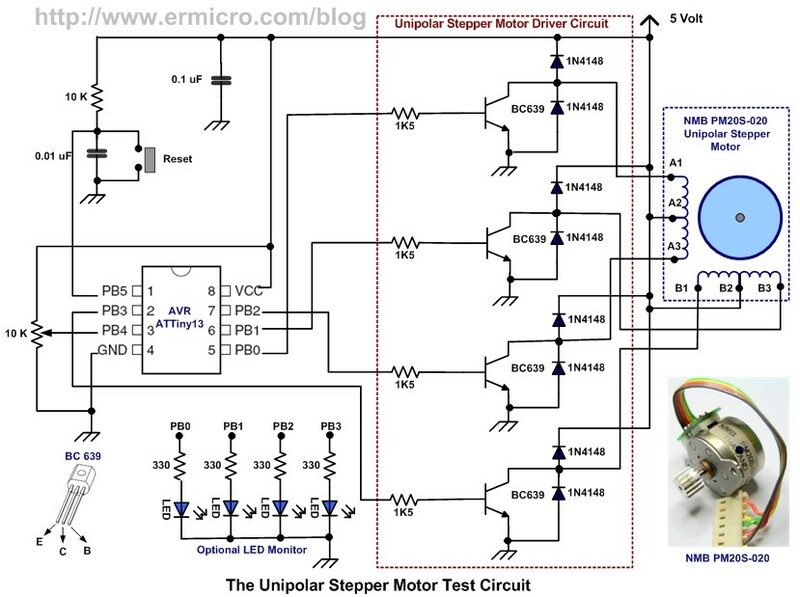 On the other hands the bipolar stepper motor actually is similar to the unipolar type but without the center tap. Two clamp diodes on each transistor are required because the winding has a center tap. Therefore when one end of winding is high (Vcc) the other end is low (GND) the lower diode will bypass the back EMF (Electromotive Force) voltage that appear on BC 639 transistor collector and emitter terminals. You could easily adapt the step sequence to your own unipolar stepper motor by changing both the cwstep_seq (clockwise rotation) and ccwstep_seq (counter clockwise rotation) array variables data in the program. Using the AVR ATTiny13 microcontroller TIMER0 interrupt we could easily supply the required output steps to the stepper motor. I used the ADC (Analog to Digital Conversion) to control the stepper motor step sequence delay as well as to change the rotation direction by adjusting the 10K trimport. For more information about AVR ADC and TIMER0 you could read these blog’s articles “Analog to Digital Converter AVR C Programming” and “Working with AVR microcontroller Communication Port Project“. You could also replace the BC639 transistor with the Darlington pair transistor array such as ULN2803A from Texas Instrument mention above. 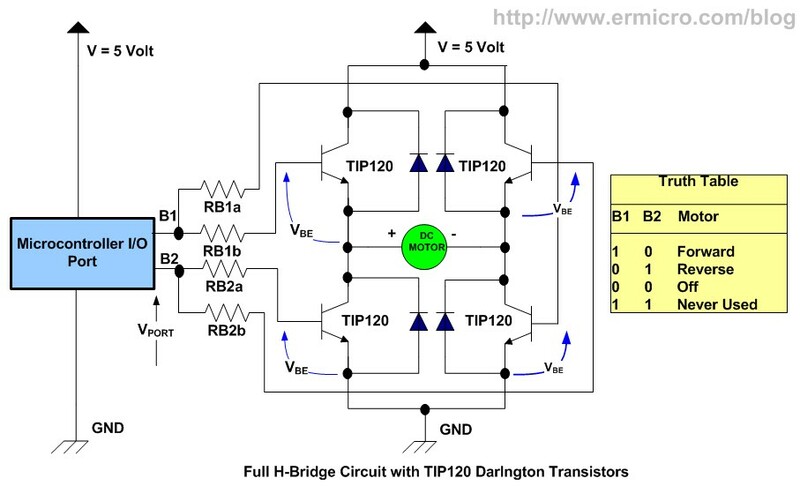 Using this Darlington pair transistor array make the unipolar stepper circuit become simpler (less components) because it has the required clamp diode on each Darlington transistor pair and you could take advantage of higher current gainer provided by the Darlington pair transistors. To drive the bipolar stepper motor; each of the two windings will require the H-Bridge circuit similar to the H-Bridge circuit for driving the DC motor mention above. Therefore we need at least 8 transistors to drive the bipolar stepper motor (4 transistors on each windings). By forwarding and reversing the current flow on each winding we could achieve the required steps sequence to drive the bipolar motor. 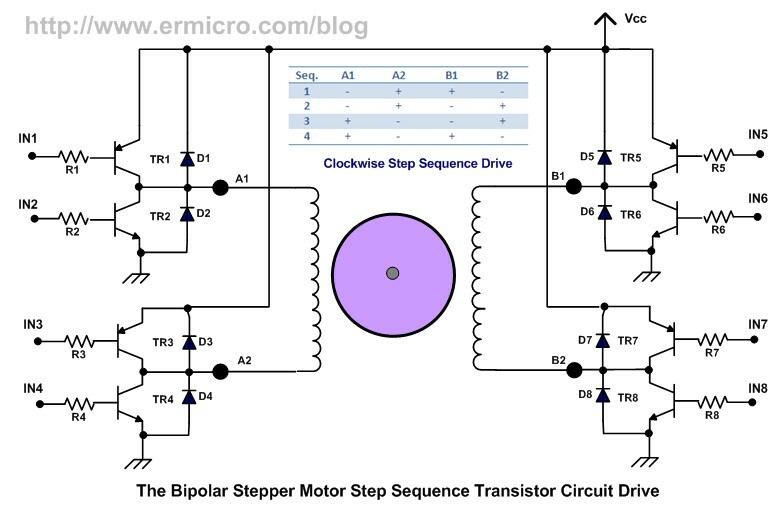 And by supplying the correct steps sequence logic to IN1, IN2, IN3, IN4, IN5, IN6, IN7, and IN8 input from the microcontroller output port we could make this bipolar stepper motor to rotate. The opposite direction (counter clockwise) rotation could be achieved by reversing the steps sequence (i.e. 4, 3, 2, and 1). 1. 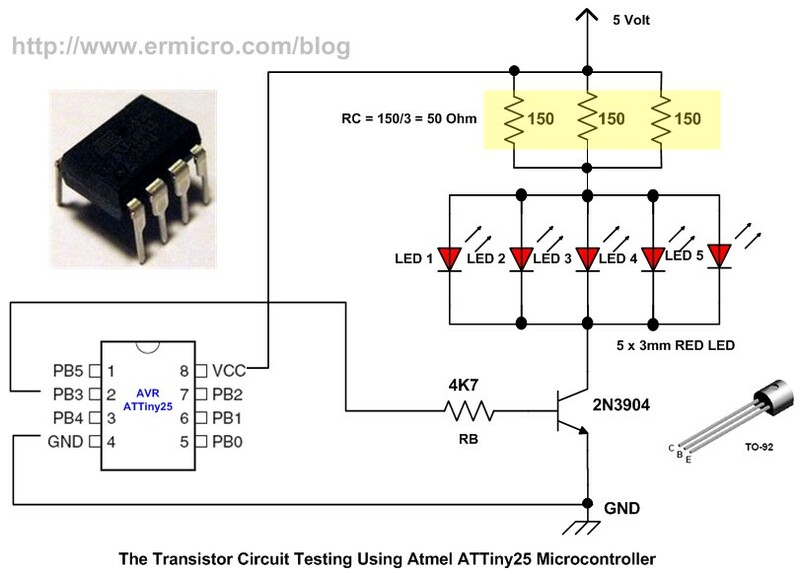 This following video show you of how to drive a transistor which connected with 5 red LED using the Atmel AVR ATTiny25 microcontroller. I’ve had a go at making the final H-bridge circuit shown here using TIP120 darlington pairs and had a bit of trouble. If I split the connections from the microcontroller after the resistors RB1 and RB2 (as shown in the circuit diagram) then it doesn’t seem to work, however if I split the signal before the resistors and use 2 resistors for each of RB1 and RB2 then it does work. I’m not sure I understand why yet maybe somebody can explain. Thankyou for this great post. I was wondering about using the transistor as a switch with my avr. I am sorry if this sounds like a total newbie question but in your pics (in which you dont use a optocoupler) you connect both the 12V circuit and the micro ground to a common ground. 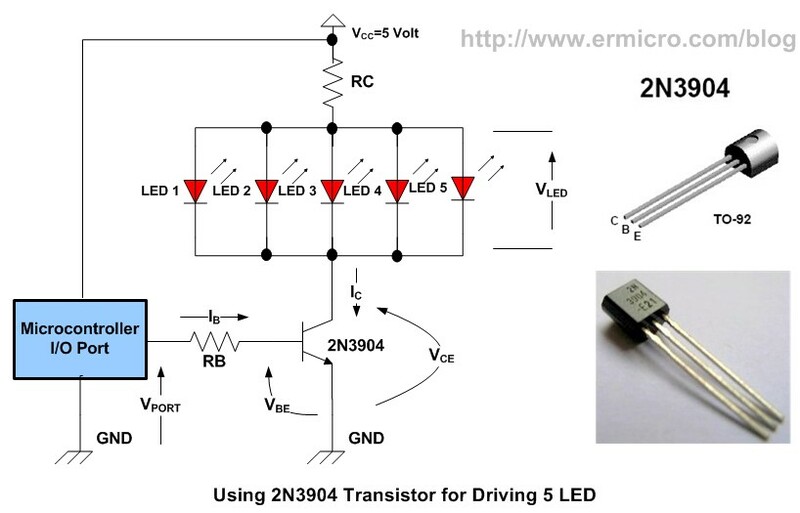 My question is how to implement the 12V and 5V part? I mean let’s say I am using common batteries (8 batteries= 12V) I connect the motor to the 12V part but where do I connect the 5V pin of the micro to?? You should have two separate DC power sources (e.g. 3 AA batteries for 4.5 volt and 8 AA batteries for 12 volt); the first one is the 5 volt or 4.5 volt which is used to power the microcontroller circuit and the second one is the 12 volt which is used to power the Darlington transistor and the DC motor. In order to make the darlington transistor work (ON) we have to provide adequate voltage between the base and the emitter terminal; this voltage is provided by the microcontroller I/O port (powered by 5 Volt source), that is why we have to connect these two voltage sources on the same common ground. For the H-bridge part i was thinking of using 2N2222’s (since my motor only needs around 280mA). or use Toshiba TA7291S bridge circuit. These circuits are made of transistors it seems but how can you see if they generate enough current C-E (as we did for transistors in this tutorial)? I cant seem to understand their datasheet. When you choose the transistor (e.g. 2N2222A); from datasheet Ic max = 800 mA, remember this is the maximum value, usually in real application we only use just half of its maximum capacity which is 400 mA. When you measure the DC motor make sure you also take into the consideration the DC motor stall current (i.e. motor on heavy load, where its almost stop) not reach the 400mA limit; unless you only use the DC motor as a free running DC motor (without or have a very small load). When using the Toshiba TA7291S bridge all you need is to supply the correct standard logic voltage to the IN1 and IN2 input pins; the integrated circuit inside TA7291S will make sure you get the saturate transistors condition on its output (average 0.9 volt). The input current on the IN1 and IN2 pins is very low (about 3 to 10 uA with Vin = 3.5 volt). Very illustrative, basic and simple facts required to work with micro controls. Lhank you Mr. Besinga for creating this tutorial. please let me introduce my self. my name Taufiq Sunar. I am a student of Electronics and Instrumentation in Gadjah Mada University, Indonesia. Currently I’m trying to make a switch using MOSFET with input from the AVR microcontroller PWM. I’m planning to use MOSFET series IRF740, IRF9530, IRF9540, or IRFZ44. Whether working principle and the calculation of MOSFET is similar to BJT transistor? Thank you very much for your answer! Nice to know you Taufiq. Bipolar Junction Transistor (BJT) is different compared to Metal Oxide Semiconductor Field Effect Transistor (MOSFET), therefore all the calculation for BJT could not be applied to MOSFET. Where VDS: gate to source voltage and IDS: drain to source current. As you notice there is no IG (gate current) on the MOSFET gain factor formula; because of the issulation oxide on the MOSFET gate terminal design, therefore there is no current flow on the MOSFET Gate terminal (MOSFET is also known as a very high input impedance transistor). The IDS (drain to source current) will start to increase when the VGS voltage is above the VGS threshold voltage. Any small VGS voltage change applied to the MOSFET Gate input terminal will be amplified by the factor of gfs and reflected as a Drain current on the MOSFET Drain terminal side. Therefore by supplying VGS much greater than VGS threshold voltage, we could easily push the MOSFET into its saturate region. 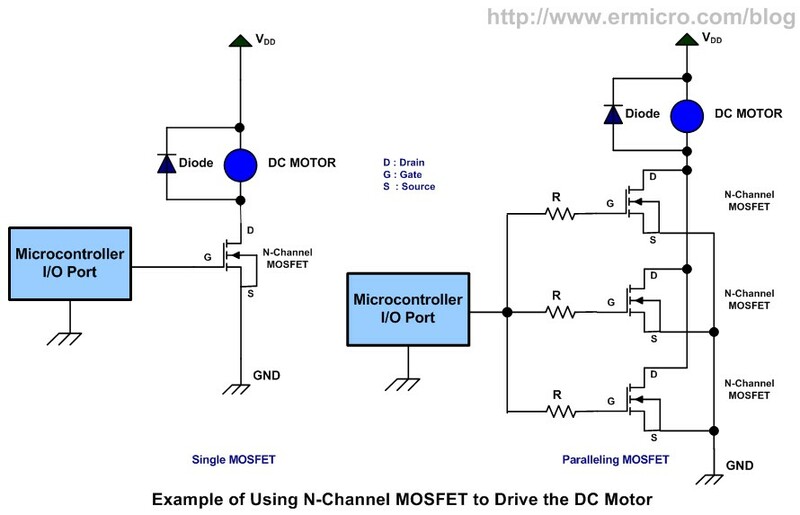 This make using the MOSFET is more simple compared to BJT as all you need is to connect the MOSFET gate terminal directly to the AVR microcontroller output port. The AVR microcontroller output port voltage (high logic) could easily drive the MOSFET into its saturate region, but make sure you always read the MOSFET datasheet especially the VDS, IDS, gfs, and VGS threshold when using different type of MOSFET. Thank you very much for the explanation Mr. Besinga. Actually, I want to make a high-speed switch from AVR microcontroller PWM. PWM output is squarewave. Whether after connected into the MOSFET, its output also a squarewave? Because I’ve tried using a IRF740 MOSFET, and 8-bit fast pwm. But the results was not squarewave and its currents and voltages are very small. The PWM input was connected by 4k7 resistor to its gate. And its source supplied by 12V with 10k resistor. Yes the output should be a square wave when the input is a square wave. You could read more about AVR Fast PWM on “Working with Atmel AVR Microcontroller Basic Pulse Width Modulation (PWM) Peripheral” article. Actually you don’t need to use 4K7 resistor (current limiter) in series with the MOSFET Gate terminal, because there is no “Gate Current”, therefore you don’t have to “reduce” the current as it in BJT. 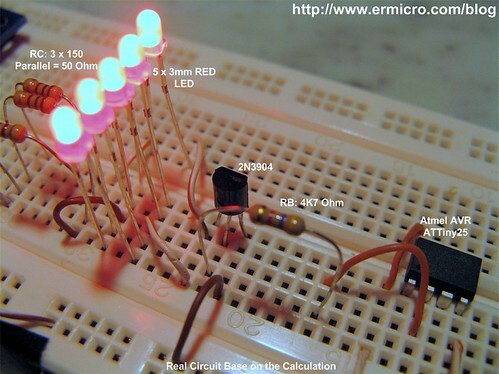 If you want to use resistor use the voltage divider circuit (2 resistors) instead of one resistor. As long as the VGS > VGS threshold and VGS > VDS, the MOSFET will turn ON. I’ve been trying to make a H-Bridge circuit using 4 TIP120’s as per the above diagram and everything works fine if the motor voltage is around 5V. However if I raise the motor voltage to 9 volts I only see about 3.5 volts at the motor. The problem seems to be that the TIP120 can switch the motor to ground but it can’t switch the full 9 volts when it’s base is 5 volts. 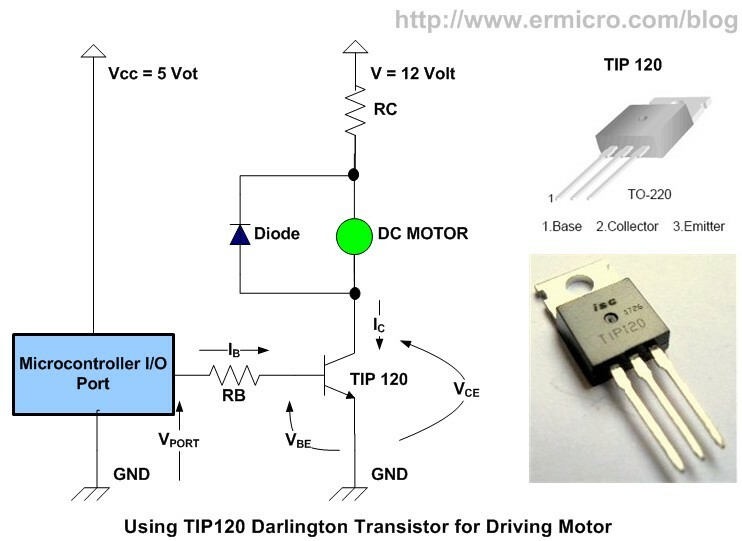 In other words the circuit labled Using TIP120 Darlington Transistor for Driving Motor works but if I move the transistor between V and the motor it doesn’t work. It looks like I need to use something like TIP125’s for the top transistors in the H-Bridge. 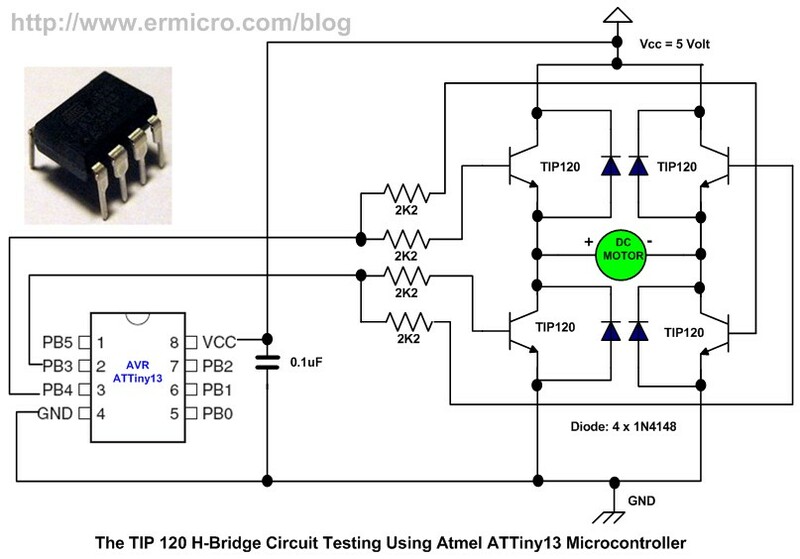 Yes, the all TIP120 H-Bridge circuit only work when the base and collector has the same power supply voltage. Because the top TIP120 (NPN) transistor is in common collector configuration and in order to turn ON the transistor, we need to forward bias the VBE, therefore if the base voltage is less then the collector voltage it will not turn ON. When you use the TIP125 (PNP) for the top transistor then all the transistors will have the same common emitter configuration. I will do some correction and add example on the article above, thanks for your comment. Hi there, This is a very informative post. Your hard work is very appreciated by everyone who luckily lands here. PDTA143E where the resistors and their ratio is all correct for +5V power supply? You could use any PNP potential divider type of digital transistor as long as you choose a suitable Ic max for your need. I must tell you that this post was awesome, a great work! Detailed explanation, good photos and wonderful schemas. Keep going updating yours, ’cause is very nice! WOW ! this is an EXCELLENT tutorial. Well done ! Thanks you very much for your post. Please i want to know how to use IGBT as switch? But i know how to use as inverter. IGBT (Insulated-Gate Bipolar Transistor) basically is similar to MOSFET (Metal-Oxide Field Effect Transistor). The IGBT will turn-on (conduct current from Collector to Emitter) by applying an adequate Gate to Emitter voltage. you explained differneces between BJT and MOSFET. I want to know, how to use IGBT as amplifier? Please Mr.rwb. thanks you. I would like to get some feedback/help on my circuit. I have built a vacuum pump for vacuum assisted brake system (don’t laugh :)). I am going to use digital vacuum switch to make the vacuum pump turn ON under low vacuum (below 15 inches of mercury [in Hg] ) and turn OFF under high pressure (upto 22 inches of mercury) for effective brake. I have various vacuum switches, mainly with 2 options 1. NPN Open Collector Output 2. Analog output. You could connect the open collector with resistor to Vcc, next connect the collector to the base of PNP or NPN transistor to drive a relay. Thank you…very helpful and informative. Thank you for an in-depth explanation on driving MOSFET’s. I Really like your way of explaining things! I’m building a high current power supply, and was having difficulties driving my MOSFET with a PWM signal. After resolving to the Darlington configuration the problem was solved! What an amount of work! I wonder, what software do you use for making your appealing images and diagrams? I don’t think b) is what was intended.